Visitors and staff alike tell us that, unless you live really close to London, when coming to Summer of Sonic it's usually a good idea to stay in the city overnight (whether it be the night before, the night after, or both as most of our overnighters do!). You get plenty of time to get to the venue, enjoy the full day of SoS festivities, and hang out with old and new friends afterwards! Finding a hotel, especially in London, can range from challenging to daunting if you're on a budget or don't know London well. So we've put a short guide together based on our own experiences (Updated 2nd July). It's useful to remember that London is a well-connected city, and you don't necessarily need to stay near the venue, as long as you're in the more central/western parts of Central London and not too far from public transport. Know a good deal we haven't mentioned? Get in touch and it may end up on this page! 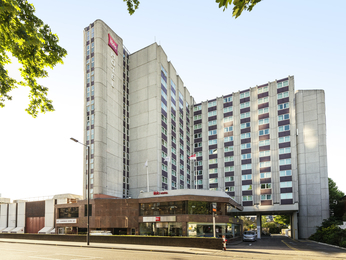 The most convenient option by far is the Hotel Ibis Earl's Court (also known as the Hotel Ibis Trigger), which is connected to our own ILEC Conference Centre. You'd literally be staying on top of Summer of Sonic if you stayed here! The Ibis offers double and twin rooms. The current rate is £76 per room for Friday night, and £104 per room for Saturday night. A lot of our staff are staying here, simply for the convenience. Being a chain hotel, you know what you're getting - good beds, good lighting, en-suite bathroom. Breakfast isn't included though, and it's £11.50 per person per day if you want it. Other chain hotels in the area include Holiday Inn (5 mins walk), Travelodge (10 mins) and Premier Inn (20 mins). We haven't been able to find much in the way of good deals, but one we have found is the Imperial County Hotel * at Euston. Holiday company SuperBreak is currently offering single, double and twin rooms for a flat rate of £37 per room per night via the link above. They also do package deals which include train travel to and from London - well worth checking if you haven't sorted out travel yet. Our Buzzbombers host Dave has stayed at the County for previous SoS events, and some of our staff are staying there this year too. Euston Underground station is a 5 minute walk, and 20 minutes to the venue's closest station. A buffet-style full English breakfast is included, the hotel is well-maintained (if a little old-fashioned), and amenities are close-by. On the flip side, the single rooms are quite small, and shower and toilet facilities are shared between three rooms (no en-suite). Independent hotels and Bed & Breakfasts are an alternative to the big chain hotels, but unlike them you don't know what you're getting - they could be great, or they could be terrible. They're often cheaper and/or closer, though. If you need a super-budget option, you could try a hostel, but as far as we know there are no hostels close to the venue. Good sites for comparing hotels & hostels include Trivago and Booking.com.